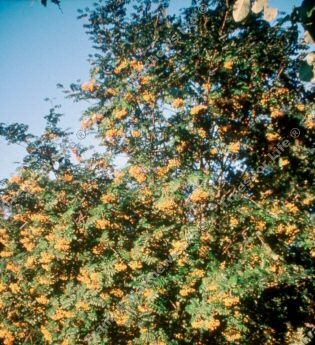 Wisley Gold (Sorbus 'Wisley Gold') is a pretty, yellow-fruited variety of Mountain Ash or Rowan. It carries impressive heavy bunches of golden fruit. Introduced by the RHS from a seedling on Battleston Hill at Wisley with a likelihood of S. ‘Ethel's Gold' as its parent. A medium height tree, so expect a height of up to 6 metres (20 foot) after 10 years. This tree is supplied at a height of between 1.50 and 1.70 metres and supplied in a 12 litre container for year round planting and better results than from either bare-root or rootballed stock. August 2012: Safely delivered and looking great. A great service. Also delighted with your after sales care. John A.